The deaths of seven U.S. service members in Afghanistan were announced this past week by the Department of Defense. Four Army soldiers died Sept. 16 in Zabul Province when they were shot by Afghan police after coming to their aid at a security checkpoint that was attacked by insurgents. One of the four killed was Pfc. 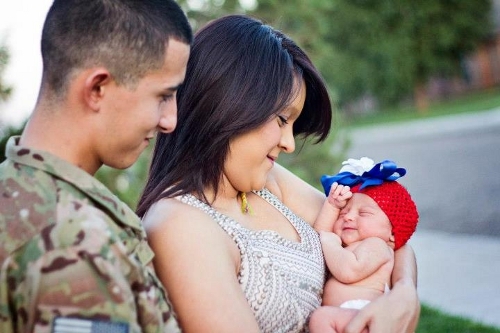 Genaro Bedoy, 20, of Amarillo, Texas, who had a wife and seven-week-old baby girl (pictured above). Bedoy played wide receiver and defensive back for River Road High School. "Genaro was a good kid. He always worked hard for me," his football coach, Bryan Welps, told the Lubbock Avalanche-Journal. The coach said Bedoy talked to him about his decision to join the Army. "I thought it would be good for him," he said. Bedoy was assigned to 52nd Infantry Regiment, 3rd Stryker Brigade Combat Team, 2nd Infantry Division, Joint Base Lewis-McChord, Wash.
Also killed were Sgt. Sapuro B. Nena, 25, of Honolulu, assigned to 2nd Battalion, 3rd Infantry Regiment, 3rd Stryker Brigade Combat Team, 2nd Infantry Division, Joint Base Lewis-McChord, Wash.; Spc. Joshua N. Nelson, 22, Greenville, N.C., assigned to 202nd Military Intelligence Battalion, 513th Military Intelligence Brigade, Fort Gordon, Ga.; and Pfc. Jon R. Townsend, 19, Claremore, Okla., assigned to 1st Battalion, 23rd Infantry Regiment, 3rd Stryker Brigade Combat Team, 2nd Infantry Division, Joint Base Lewis-McChord, Wash.
On Sept. 15, Marine Sgt. Bradley W. Atwell, 27, of Kokomo, Ind. and Marine Lt. Col Christopher K. Raible, 40, of North Huntingdon, Pa., died during a Taliban attack on their base in Helmand Province. Fifteen heavily armed insurgents wearing U.S. Army uniforms and suicide vests snuck into Camp Bastion and incinerated six U.S. fighter jets, each worth about $25 million. When the attack began, Raible was heading to video-chat with his wife and three children after dinner. Armed with a handgun, Raible rushed to the scene and coordinated the Marines' response before he and Atwell were killed by wounds suffered in an explosion. "It was very fitting that he was killed leading his men from the front," said Maj. Greer Chambless. Raible was assigned to Marine Attack Squadron 211, Marine Aircraft Group 13, 3rd Marine Aircraft Wing, I Marine Expeditionary Force. Atwell was assigned to Marine Aviation Logistics Squadron 13, Marine Aircraft Group 13, 3rd Marine Aircraft Wing, I Marine Expeditionary Force. On Sept. 20, Army Sgt. Jason M. Swindle, 24, of Cabot, Ark., died in Panjwa'l of injuries sustained when he was attacked by a rocket-propelled grenade while on mounted patrol. Swindle was assigned to 1st Battalion, 64th Armor Regiment, 2nd Heavy Brigade Combat Team, 3rd Infantry Division, Fort Stewart, Ga. Remind me again Why are we in Afganistan? We need to send the troops home by mid-2013. There's nothing we can accomplish in Afghanistan in the next two years that we didn't already accomplish the past 11.